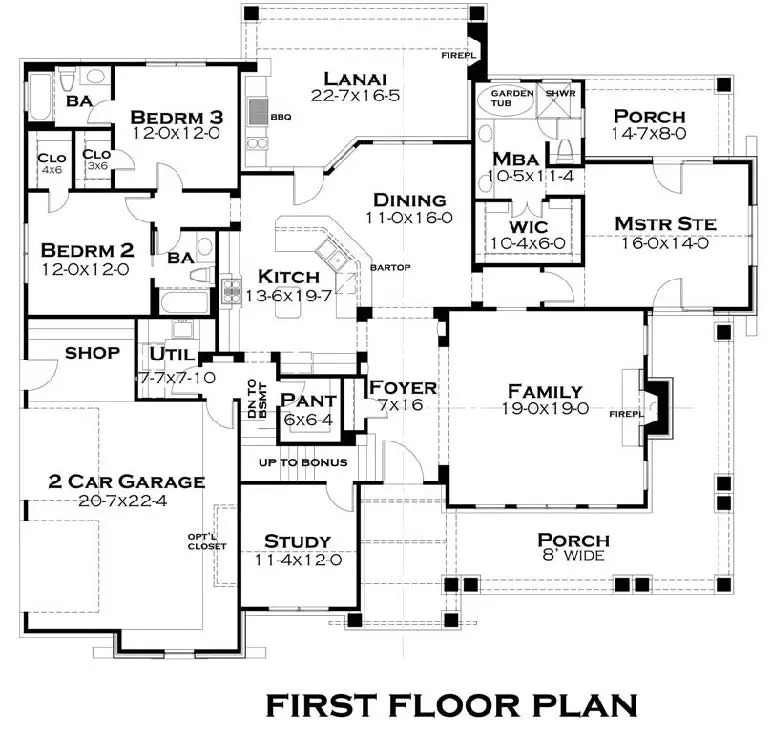 Unique Floor Plans | Edenton, NC | Sound Home Builders, Inc. Without compromising any of the unique Gardner-style features, we've created a beautiful family home designed for easy building and easy living. 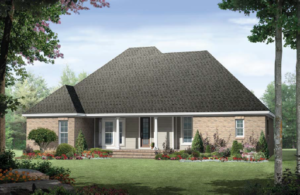 The refined, traditional exterior stops traffic with eye-catching brick, double dormers, and a hip roof. Inside, the foyer opens to a generous great room with cathedral ceiling and fireplace. Columns define the entrance to the kitchen with center island, while the entrance to the master suite is secluded beyond the breakfast area. 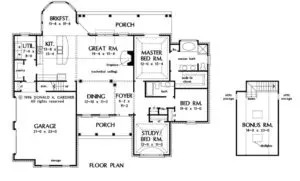 The master bedroom, dining room, and front bedroom/study receive the distinction from tray ceilings. The two family bedrooms share a full bath with a linen closet. Opt. Tray Ceiling in DR, Study & Master BR. 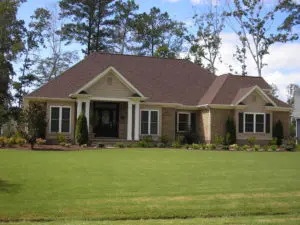 Comfortable family living was the motive for the design of this home which features well-planned living areas as well as a stunning brick exterior. The great room pulls all areas of the home together. Columns define the area set aside for formal dining, while casual family meals are enjoyed in the sunny comfort of a bay window. 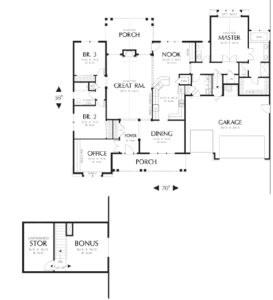 Both the master suite and from bedroom/study boast tray ceilings. 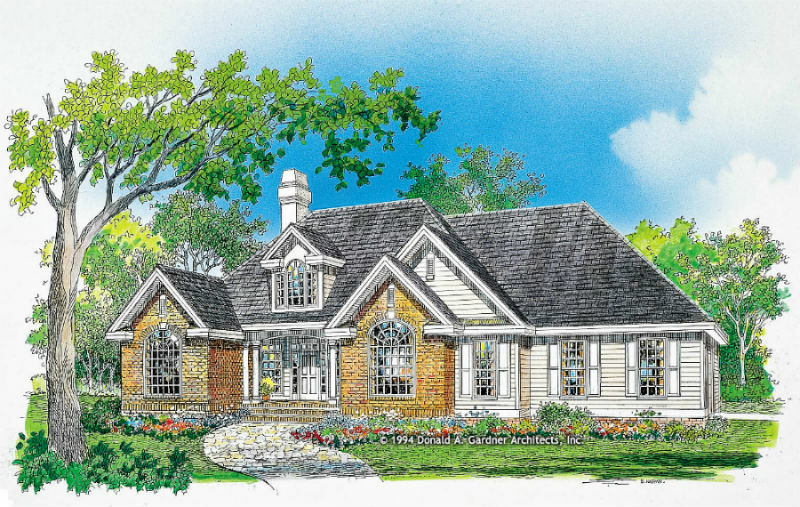 The master suite features double doors to a back porch, a large walk-in closet, and a lavish bath with separate shower, garden tub, and double-bowl vanity. 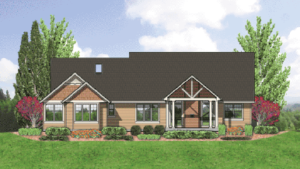 With a traditional, elegant exterior and lively interior spaces, this three bedroom executive home make both everyday life and entertaining a breeze. A Palladian window floods the foyer with light for a dramatic entrance, alluding to a surprising, open floor plan. Whip up a gourmet meal in the well-planned kitchen while chatting with family and friends in the large great room with cathedral ceiling, fireplace, and built-in cabinets. 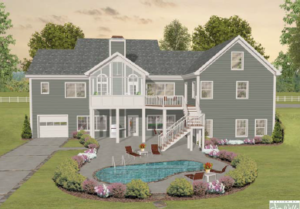 The screen porch, breakfast area, and master suite access the deck. 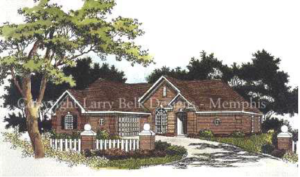 A large master suite, located in the rear for privacy, features a luxurious skylit bath with separate shower, while skylit bonus room above the garage adds space when needed. Optional Tray Ceiling in the Study & DR. Heated Area: 2,405 Sq. 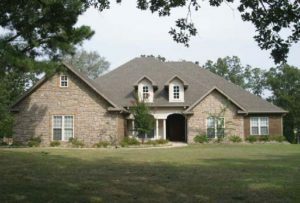 Ft.
Main Floor: 2,405 Sq. Ft. Bonus Space: 358 Sq. Ft.
Width: 66 Ft. Depth: 67 Ft.
the family with a computer center nearby. 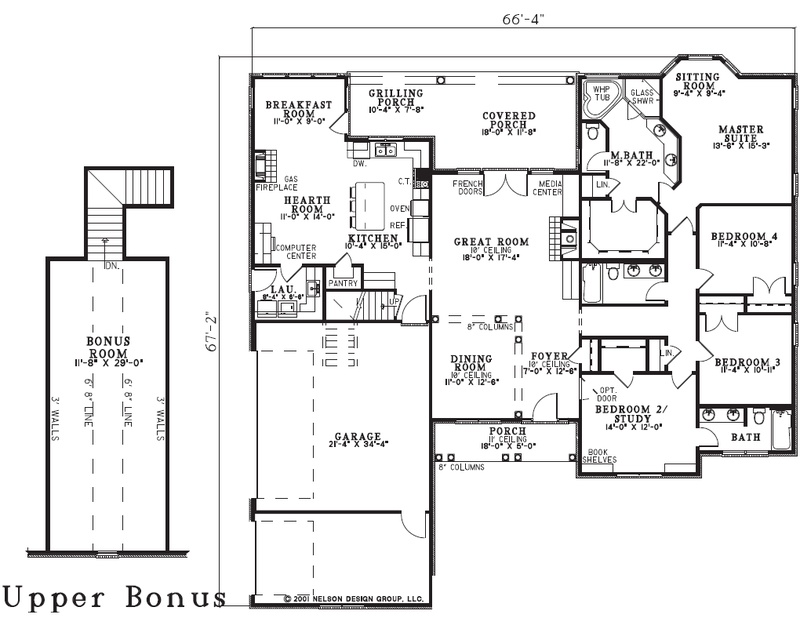 Upstairs, you'll discover a bonus room that can be converted into a playroom for the kids when company drops by. Heated Area: 2,267 Sq. Ft.
Main Floor: 2,267 Sq. Ft. Bonus Space: 439 Sq. Ft.
Width: 72 Ft. Depth: 64 Ft. 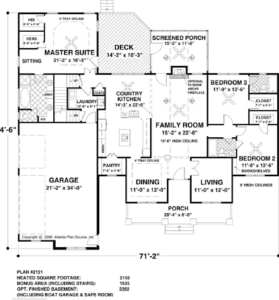 The kitchen and dining areas were located at the rear for the family who finds themselves more oriented to barbecuing and porch sitting - including a back lanai fireplace. 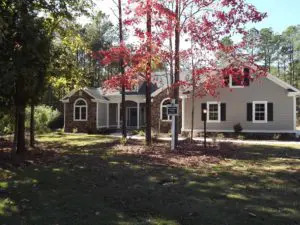 The arrangement of the family and kitchen areas provides the ability to enjoy multiple entertaining opportunities at once, for example, a conversation around the dining/kitchen bar while the football game is enjoyed in the family room. 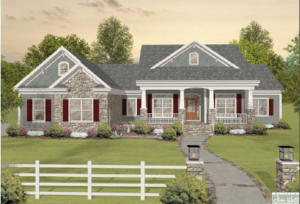 A Traditional Exterior combined with an open design and amenities normally found in larger home make this plan a popular choice. Inside, twelve-foot ceilings in the entry, living room and dining room open the house. The dining room is defined by three columns connected by arches and adds elegance to the home. 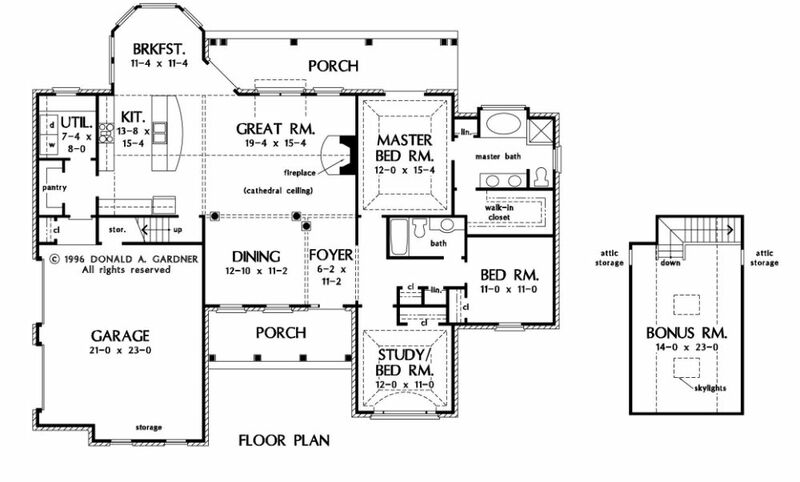 The split-bedroom plan separates the master bedroom from the bedrooms 2 & 3 to allow more privacy for the owner. 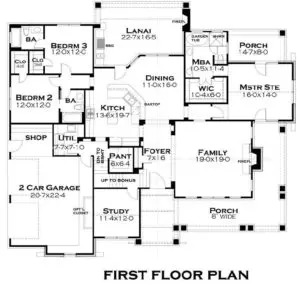 The family room, breakfast area and kitchen are designed together for informal, friends & family use. Heated Area: 2,373 Sq. 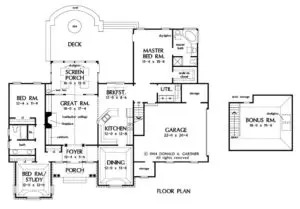 Ft.
Main Floor: 2,373 Sq. Ft. Bonus Space: 226 Sq. 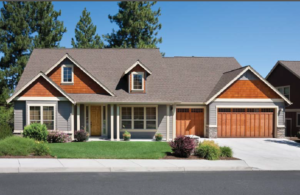 Ft.
All of these house designs can easily be customized to meet your needs, and lifestyle. 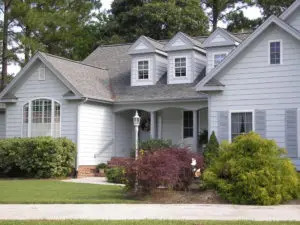 This delightful one-story cottage presents a split-bedroom layout that which places the master suite and secondary bedrooms on opposite sides of the plan gives privacy and separation to older children and guests. 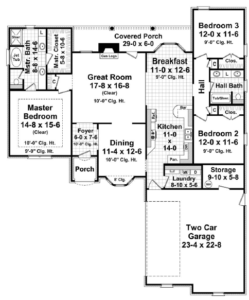 What’s more, the home also features a large dining room next to the kitchen, great for entertaining. You’ll love the homes other spaces equally, including the airy great room, in which groups of furniture can be arranged around the fireplace at the back of the room and around optional media built-ins at the front of the room. Like the dining room, the bright breakfast nook is large and it connects to an outdoor patio a tempting place to have an early morning repast. Heated Area: 2,156 Sq. 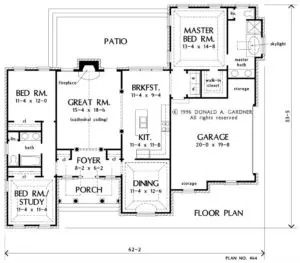 Ft.
Main Floor: 2,156 Sq. Ft. 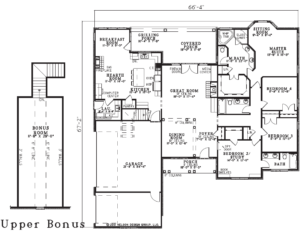 Bonus Space: 1,535 Sq. Ft. Relax in the luxurious master suite which includes a tray ceiling, a sitting area, his and hers walk-in closets, and exquisite bath. 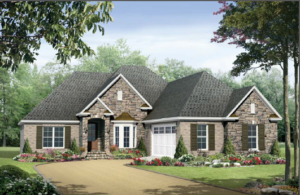 The 14'-3" x 22'-6" country kitchen, with a walk-in pantry, is open to the vaulted family room. A French door leads to the vaulted screened porch. 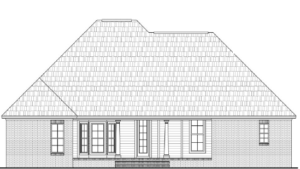 The deck is accessible from both the screened porch and master bedroom. A decorative square column and tray ceiling adorn the elegant dining room. 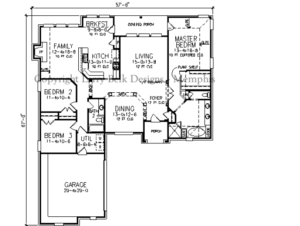 Bedrooms two and three each feature walk-in closets and individual baths. 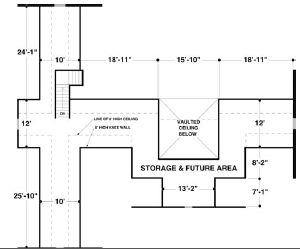 Tucked behind the functional laundry room are stairs accessing the optional basement and future bonus area. Heated Area: 1,876 Sq. 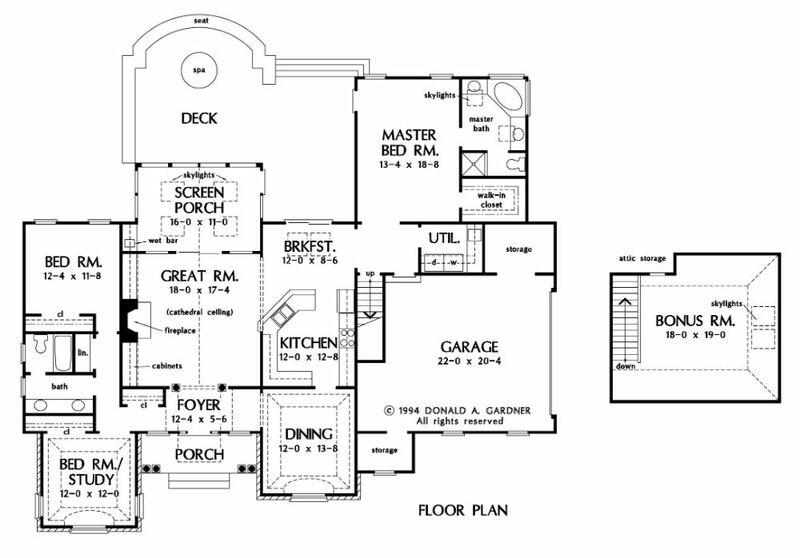 Ft.
Main Floor: 1,876 Sq. Ft. This beautiful country home features all of the amenities that your family is looking for. Two large bedrooms, each with plenty of closet space, share a bath complete with dual sinks and a tub shower. 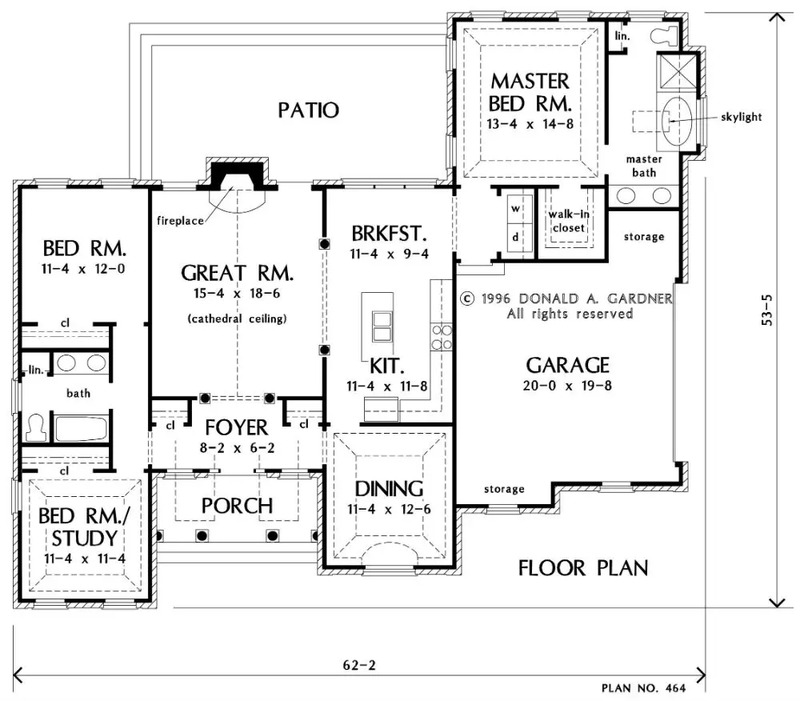 The master suite features a raised ceiling, a large walk-in closet, and a great bathroom layout. The great room features 10 ft. ceilings and a gas log fireplace which provides a perfect atmosphere for relaxing with family and friends. Both eating areas feature bay windows which allow plenty of natural light and make for enjoyable family dining experiences.